It's often said the hardest part is just getting started. If you're staring at a blank screen or sheet of paper, and you're struggling to find the words, try jump-starting your writing process with a fun warm up exercise. That'll get the ballpoint rolling! 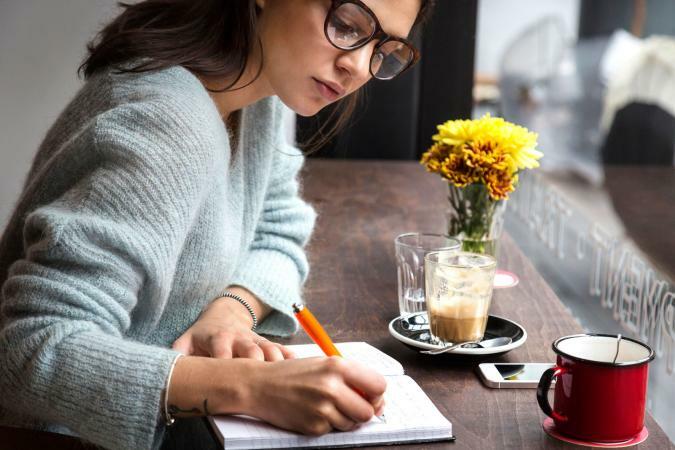 Free writing, sometimes called freewriting or automatic writing, is a process by which you start writing anything and everything that comes to mind without any filter or concern about structure. It's essentially an applied version of free association, except everything is written down. To provide a little more structure to this writing exercise, you may set a goal based on time or length. Dedicate yourself to five minutes of continuous writing, for example, or until you reach a certain word count. An online tool like WordCounter.net is ideal for the second scenario. Open the floodgates of your creativity! Depending on how much time you want to spend on this writing exercise, you can choose to choose either to start each subsequent word or sentence with the next letter of the alphabet. In this way, you'll end up with either a short 26-word paragraph or a longer 26-sentence story. This exercise helps to work on your vocabulary, finding the right word that starts with the right letter. For example: As Bob careened down easily, Frank grinned heartily in jest. Karen laughed maniacally now over poor, queasy Robert sliding under Verna's wardrobe. (E)xcellent zooming! Use a random word as a launching point on which to build a unique narrative. Merriam-Webster has a "word of the day" feature that's perfect for this writing warm up, or you can generate new random words on RandomWord.com each time you load the page. For a more advanced and directed approach, select two random words. Then, work on a story that forges a connection between them in some creative way. Don't worry about getting these perfect; the goal is to have a little fun and to get your creative juices flowing. A limerick is a humorous type of poem consisting of five lines. The first, second, and fifth lines all rhyme with one another and are about 10 syllables each. The third and fourth lines rhyme and they're a little shorter at about six syllables. Browse through some examples of limericks to get used to the format and to find a little inspiration. Another great way to generate writing ideas is to consider what might happen after the end of a popular work of fiction. For example you could use a Disney or Pixar movie as your creative impetus, expounding on what happens after Elsa returns to Arendelle or after Simba retakes his rightful place over the Pride Lands. You might also think about the last book you read or the last TV show you watched, or consider writing a brief "prequel" to one of your favorite works. Keep this exercise short, as it's only meant to warm you up to your primary task at hand! Pick an object, it could be on your desk, outside your window, or from your imagination, and describe it as specifically as possible using all five senses. Utilize descriptive adjectives and make a point to differentiate this object from others like it. For a slightly different writing warm up exercise, embody the random object and imagine the world from its perspective. What does it see, hear, smell, touch, and taste? Hungarian psychologist Mihaly Csikszentmihalyi is a champion of the concept of "flow," a mental state where you are absorbed in the current experience. As a writer, you may be seeking this phenomenon where the words just flow naturally from your mind to your fingers. With some of the warm up writing exercises described above, you can get a rolling start toward that ideal.